The Roll Products 163-0014 litho removable adhesive HMIG label is a customizable self-adhesive label with blank text areas and color-coded hazard information fields to mark containers or packages with safety information about a reagent contained inside. The label is 2-1/2″ wide by 1-1/2″ tall, with rounded corners, and comes in a roll of 250 labels. It displays a blank, four color, diamond-shaped, National Fire Protection Agency (NFPA) 704 symbol, also known as the fire diamond, to fill in and present hazard level index codes in the four standard Hazardous Materials Identification Guide (HMIG) categories: health, flammability, reactivity, and personal protective equipment. 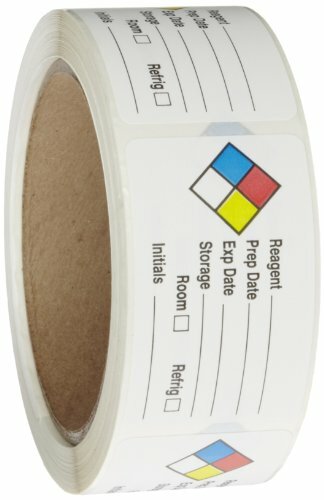 This label provides lined blank text areas for adding schedule and storage information about a reagent, using black text on a white background for high contrast and legibility, and helps material handling, delivery, and emergency personnel to identify the risks posed by the labeled reagent. It uses removable adhesive so that it can be peeled off of a nonporous surface without tools. HMIG is a labeling system developed by Lab Safety Supply Inc. (now Grainger) to meet the Occupational Safety and Health Administration (OSHA) Hazard Communication Standard (HCS) requirement for chemical labels. This color-coded system uses hazard level index codes, with a blue bar to display the health information, red for flammability, yellow for reactivity, and the white area for personal protection. The HMIG information is presented in the diamond-shaped NFPA 704 symbol to conserve space on a small label, and, due to the similarity of the two systems and the common use of the NFPA 704 symbol, conveys nearly identical information (the NFPA system assumes a fire is present, HMIG does not).